The collection included a calendar, which would have been essential for calculating the date of Easter and also for use to organise daily prayer services. Different prayers would have been said depending on which feast day it was. This calendar, however, is incomplete. 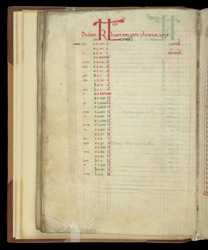 It gives the usual information found in medieval calendars: the number of days and nights in the month and the 'golden numbers' and 'dominical letters' which aided determining which weekday a date would fall on in a given year. What is lacking are the saints' feast days and major feasts (the Nativity or Christmas). Probably it was left unfinished because other calendars were available. On the left side of the page, the divisions of the Roman monthly system were written: Kalends (KL, for 'month'), nones and ides.